Amazon has sparked a bidding war, and it's only just beginning. The ecommerce giant said on Thursday that it was soliciting bids from cities across North America for a place to build its second headquarters — its first outside of the Seattle area. Amazon said it would be investing $5 billion in the construction of its new headquarters, and it hopes to eventually house 50,000 Amazon staff there, gradually building up its workforce over time. "We expect HQ2 to be a full equal to our Seattle headquarters," CEO Jeff Bezos said in a statement. "Amazon HQ2 will bring billions of dollars in up-front and ongoing investments, and tens of thousands of high-paying jobs. We're excited to find a second home." Unsurprisingly, cities across the United States and Canada are jumping on the opportunity to lure Amazon to their neck of the woods. Many officials have already said they're planning to submit a formal proposal to the company. Amazon has some requirements, however. Its new home would ideally be in a city with at least a million people, an international airport, and a "stable and business friendly environment." Of course, that means cities will need to offer incentives to the company in order for it to move there. We've found nearly 50 cities whose officials have said they are looking into or preparing to submit a proposal to Amazon. Bids are due October 19. 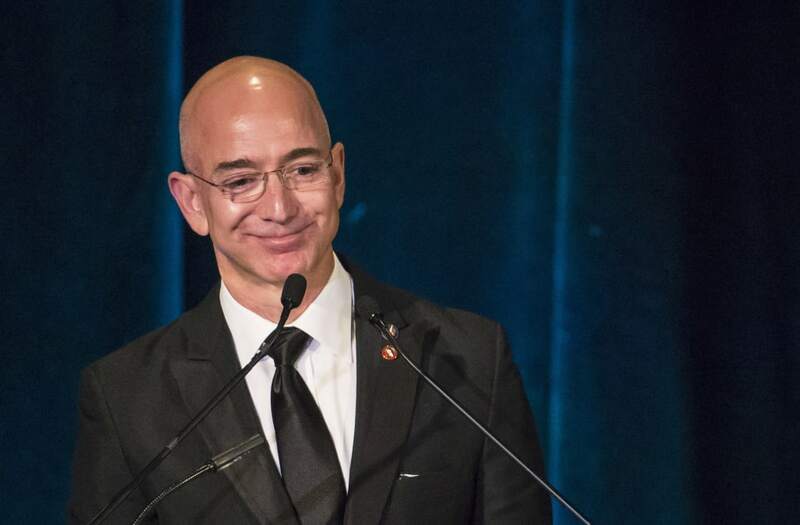 According to the Chicago Tribune, Mayor Rahm Emanuel has already spoken to Amazon CEO Jeff Bezos about the possibility of opening a headquarters in the city. Several other corporations — including McDonald's, Kraft Heinz, and Conagra Brands — have recently planned to move their base from the suburbs to this Midwestern hub. Mayor John Tory called the race for the Amazon headquarters "the Olympics of bidding." "We should be bidding for this and be very, very competitive, and I'm in the midst of talking to the other governments to make sure that's what we do," he said Thursday, according to The Toronto Star. "San Diego has the geographic proximity to international markets, unparalleled quality of life and workforce talent that companies like Amazon are looking for, so Mayor Faulconer's office has directed the San Diego Regional Economic Development Corp. to coordinate a regional response," Matt Awbrey, Mayor Kevin Faulconer's deputy chief of staff, said in a statement, according to The San Diego Union-Tribune. Mike Rosa, senior vice president for economic development of the Dallas Regional Chamber, told The Dallas Morning News that the group had "communicated to Amazon our intent to respond" to the call for proposals. "This is a megaprospect, and we have already initiated conversations with our economic development partners at the state and regional level to thoroughly consider the best possible fit for Denver and the region," said Mayor Michael Hancock, according to The Denver Post. "With an unmatched portfolio of technological talent and intriguing development parcels, Pittsburgh is uniquely positioned to submit a winning bid for Amazon's facility," Mayor Bill Peduto said, according to the Pittsburgh Post-Gazette. Both city and state officials expressed interest in petitioning Amazon for the headquarters opportunity. Mayor Catherine Pugh said the city would "pursue this opportunity aggressively," The Baltimore Sun reported. State and local officials told The Boston Globe that they would put together a bid to make Boston the site of Amazon's new HQ. They said they would most likely use a revised version of the argument that lured GE to the city. Pioneer Valley in western Massachusetts, which includes the city of Springfield, also said it was prepping a bid for Amazon's consideration. The Columbus Dispatch reported that city officials were "in the hunt" for Amazon's HQ and would submit a bid. A spokesman for Mayor Mike Duggan said the city was evaluating the opportunity "carefully," and local real-estate magnates like Dan Gilbert have thrown their weight behind the idea. The City of Brotherly Love will be making a pitch to become Amazon's second home, according to local media. The director of economic development for the city told the Phoenix Business Journal the region could be "very competitive" for the headquarters, though officials have not said definitively whether they will seek a bid. Mayor Gregor Robertson tweeted that Amazon would be a "fantastic addition" to the city's "world-class innovation ecosystem." A state official told Reuters that it planned to prepare a bid, though the official didn't specify a city. Brian Kenner, the deputy mayor for planning and economic development, said the city was "positioned to be a desirable location for Amazon's East Coast headquarters." Tim Cowden, president of the Kansas City Area Development Council, said in a statement that the city would put together an "aggressive" proposal to submit to Amazon. Mayor Jim Strickland tweeted his city's intention of making a bid, saying, "We're on it," and adding that the city "has so much to offer!" Mayor Byron Brown tweeted that he was "looking into this huge opportunity," and the county Legislature has already passed a resolution in support of the idea. Mayor Lyda Krewson said in a statement that the city would put together "a very competitive" proposal to host of Amazon's new headquarters. "I have an answer for Amazon — Sacramento," Mayor Darrell Steinberg wrote in a statement, indicating the city would ready a bid before October 19. Mayor Will Sessoms said the city was pursuing a proposal "at full speed." "The city, the state, the region — it's fair to say everyone is extremely interested in this one," a spokesman for Portland's economic development agency told The Oregonian. Mayor Don Iveson called the prospect of Amazon moving into town a "tasty morsel," according to the Edmonton Journal. "I welcome the opportunity to compete for this remarkable investment, and the tens of thousands of good-paying jobs it is sure to bring with it," Mayor Eric Garcetti said in his statement to the Los Angeles Times. "When you look at the criteria, I can't imagine a place that meets it better than Calgary," Mayor Naheed Nenshi said, according to the Calgary Herald. "I will be making that case strongly." Outside of DC, in nearby Virginia, officials told local media the county "will be pursuing the opportunity," though they didn't discuss specific locations. "I'm proud to say Milwaukee meets all your requirements and even prouder to say our incredible renaissance would compliment your vision," Mayor Tom Barrett wrote in a letter to Bezos, describing the city's intent to place a bid. A representative for Mayor Bill de Blasio told CNBC, "We are very interested in the possibility of Amazon locating a headquarters in the five boroughs and believe the city's competitive advantages position it well." "Our goal is to compete for projects on all levels," said Jonas Peterson, CEO of the Las Vegas Global Economic Alliance. "We believe our community has a great product to offer headquarters-related projects." "I've asked staff to review the application process with a view to being part of the competition," Mayor Jim Watson tweeted Thursday. Deputy City Manager Kim Walesh told the San Francisco Chronicle that her team was getting the proposal together, "but on the face of it, it is a pretty exciting opportunity." Mayor Ron Nirenberg told CNBC: "We have the workforce, infrastructure, and quality of life that all major corporations look for in a location. In coordination with the San Antonio Economic Development Foundation, Team San Antonio is ready to show that our city is in the most competitive position possible when those opportunities arise and when they align with community priorities." At least one city official thinks London would be a good fit for Amazon — Josh Morgan, the Ward 7 councillor, tweeted: "This opportunity has the potential to be transformational for the City of London and SW Ontario. I'll be raising it at Committee next week." John Rago, the mayor's deputy chief of staff for policy and communications, said the city was "on this big time," according to Technically Delaware. He continued: "This is an exciting opportunity, and we are putting together a good case for why Amazon would find Wilmington to be a welcoming and supportive home for the company's headquarters." "We are very interested in Amazon, and we will be working with other organizations in making an effort to attract Amazon to this community," Mayor William Bell told AL.com. "Rhode Island is in the game," Matthew Sheaff, a spokesman for the Rhode Island Commerce Corporation, told the Providence Journal, adding that it was too early to tell which location the state would pitch to Amazon. "We plan to make a pitch to Amazon, and we plan to work with our partners around the region to do it," Mayor Luke Bronin said in a statement to NBC. "Houston is definitely interested in the Amazon HQ project and will look into the process of formally soliciting it," a city representative told the Houston Business Journal. Marty Vanags, the president of the Saratoga County Prosperity Partnership, told the Albany Business Review that it would work with the Albany-based Center for Economic Growth "and others to develop a proposal for Amazon." Saratoga County neighbors Albany. The capital region would need to bound together all nearby counties in its bid to meet Amazon's population requirement of 1 million. Mayor John Cranley tweeted Thursday, "We are already working on our proposal." Mayor Libby Schaaf told CNBC: "We're excited to explore the Amazon HQ2 project and the benefits it could bring to our community, as well as our region. At an estimated 50,000 employees, the project would have a profound impact on Bay Area residents, and in the midst of a statewide housing affordability crisis, we would need to address all outcomes a project of this magnitude would create." "Definitely we want to compete, and compete hard and would like to win," Mike Rollins, president and CEO of Austin's chamber of commerce, told the Austin American-Statesman. "On a scale of 1 to 10, this is a 13 for us," Tampa Hillsborough Economic Development Corp. CEO Craig Richard told the Tampa Bay Times. "We have read Amazon's RFP [request for proposal] and it sounds like it was written for us." Utah isn't missing its shot to woo Amazon, either. The Lt. Govenor of Utah, Spencer Cox, tweeted: "I can assure you that we are all over this." He also joked: "I just asked Alexa to help us win the HQ2 bid, so I feel pretty good about our chances." Sun Corridor, an economic development agency working with state and local officials to submit a bid to Amazon, is sending a message to Bezos that he can't ignore. Instead of sending a letter, though, they're sending the Amazon CEO a 21-foot saguaro cactus in an effort to grab his attention and get him to consider Tuscon, according to the Arizona Daily Star.